"Kamenev" redirects here. 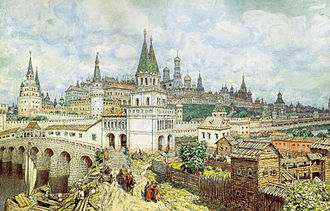 For the Russian painter, see Lev Lvovich Kamenev. For the surname, see Kamenev (surname). This name uses Eastern Slavic naming customs; the patronymic is Borisovich and the family name is Kamenev. Lev Borisovich Kamenev[a] (born Leo Rosenfeld or Lev Borisovich Rozenfeld;[b] 18 July [O.S. 6 July] 1883 – 25 August 1936) was a Bolshevik revolutionary and a prominent Soviet politician. He was one of the seven members of the first Politburo, founded in 1917 to manage the Bolshevik Revolution: Lenin, Zinoviev, Kamenev, Trotsky, Stalin, Sokolnikov and Bubnov. Kamenev was the brother-in-law of Leon Trotsky. He served briefly as the equivalent of the first head of state of Soviet Russia in 1917, and from 1923-24 as acting Premier in the last year of Vladimir Lenin's life. 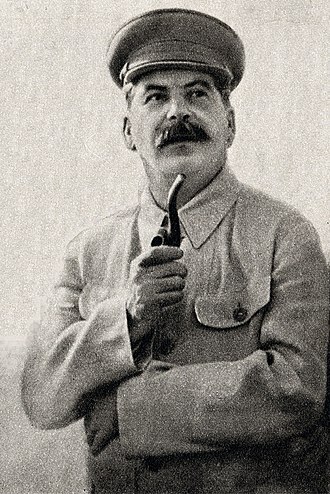 Joseph Stalin viewed him as a cause of discontent and opposition to his own leadership. Kamenev was executed on 25 August 1936 after a show trial during the period of the Great Purges. Kamenev was born as Leo Rosenfeld in Moscow, the son of a Jewish railway worker and a Russian Orthodox mother. His father used the capital he earned in the construction of the Baku-Batumi railway to pay for Lev's education. Kamenev attended the boys' Gymnasium in Tiflis, Georgia (now Tbilisi) and later Moscow University where he became involved in political activity. His arrest in 1902 interrupted his formal education. From that point on, he worked as a professional revolutionary, and was active in the capital St. Petersburg, Moscow and Tiflis. He adopted the surname Kamenev during this period. In the early 1900s, he married Olga Bronstein, a fellow Marxist (and younger sister of Leon Trotsky, who had also adopted a different surname). The couple had two sons together. Kamenev joined the Communists in 1901. He took a brief trip abroad in 1902, meeting Russian social democratic leaders living in exile, including Vladimir Lenin, whose adherent and close associate he became. He also visited Paris and met the Iskra group who published the newspaper. After attending the 3rd Congress of the Russian Social Democratic Labour Party (RSDLP) in London in March 1905, Kamenev returned to Russia to participate in the Russian Revolution of 1905 in St. Petersburg in October–December. He went back to London to attend the 5th RSDLP Party Congress, where he was elected to the party's Central Committee and the Bolshevik Center, in May 1907, but was arrested upon his return to Russia. After Kamenev was released from prison in 1908, he and his family went abroad later in the year to help Lenin edit the Bolshevik magazine Proletariy. After Lenin's split with another senior Bolshevik leader, Alexander Bogdanov, in mid-1908, Kamenev and Grigory Zinoviev became Lenin's main assistants abroad. They helped him expel Bogdanov and his Otzovist (Recallist) followers from the Bolshevik faction of the RSDLP in mid-1909. 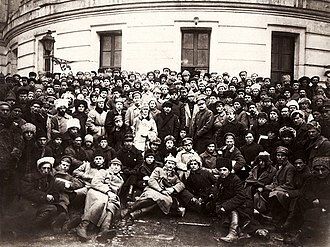 In January 1910, Leninists, followers of Bogdanov, and various Menshevik factions held a meeting of the party's Central Committee in Paris and tried to re-unite the party. Kamenev and Zinoviev were dubious about the idea, but were willing to give it a try under pressure from "conciliator" Bolsheviks like Victor Nogin. Lenin was adamantly opposed to re-unification, but was outvoted within the Bolshevik leadership. The meeting reached a tentative agreement. As one of its provisions, Trotsky's Vienna-based Pravda was designated as a party-financed 'central organ'. Kamenev, Trotsky's brother-in-law, was added to Pravda's editorial board as a representative of the Bolsheviks in this process. The unification attempts failed in August 1910, when Kamenev resigned from the board amid mutual recriminations. 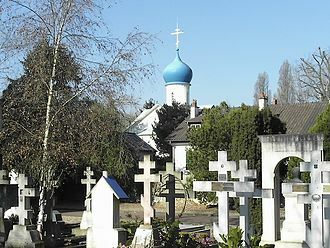 After the failure of the reunification attempt, Kamenev continued working for Proletariy and taught at the Bolshevik party school at Longjumeau near Paris. It had been founded as a Leninist alternative to Bogdanov's party school based in Capri. 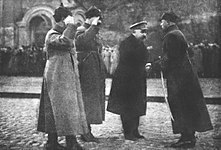 In January 1912, Kamenev helped Lenin and Zinoviev to convince the Prague Conference of Bolshevik delegates to split from the Mensheviks and Otzovists. In January 1914, he was sent to St. Petersburg to direct the work of the Bolshevik version of Pravda and the Bolshevik faction of the Duma. Kamenev was arrested in November and tried, where he distanced himself from Lenin's anti-war stance. In early 1915, Kamenev was sentenced to exile in Siberia; he survived two years there until being freed by the successful February Revolution of 1917. 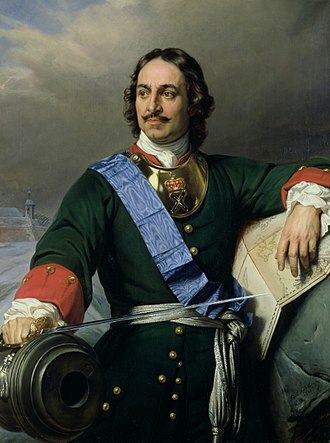 Before leaving Siberia, Kamenev proposed sending a telegraph thanking the Tsar's brother Mikhail for refusing the throne. He was so embarrassed later by his action that he denied ever having sent it. 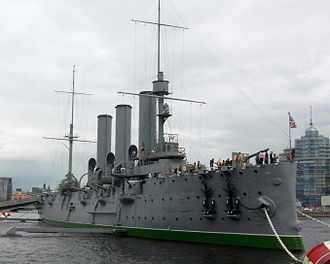 On 25 March 1917, Kamenev returned from Siberian exile to St. Petersburg (renamed as Petrograd in 1914). Kamenev and Central Committee members Joseph Stalin and Matvei Muranov took control of the revived Bolshevik Pravda and moved it to the Right. Kamenev formulated a policy of conditional support of the newly formed Russian Provisional Government and a reconciliation with the Mensheviks. After Lenin's return to Russia on 3 April 1917, Kamenev briefly resisted Lenin's anti-government April Theses, but soon fell in line and supported Lenin until September. Kamenev and Zinoviev had a falling out with Lenin over their opposition to Soviet seizure of power in October 1917. On 10 October 1917 (Old Style), Kamenev and Zinoviev were the only two Central Committee members to vote against an armed revolt. Their publication of an open letter opposed to the use of force enraged Lenin, who demanded their expulsion from the party. However, when the Bolshevik-led Military Revolutionary Committee, headed by Adolph Joffe, and the Petrograd Soviet, led by Trotsky, staged an uprising, Kamenev and Zinoviev went along. At the Second All-Russian Congress of Soviets, Kamenev was elected Congress Chairman and Chairman of the permanent All-Russian Central Executive Committee. 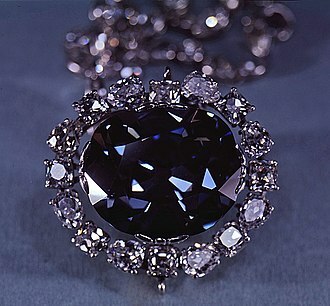 The latter position was equivalent to the head of state under the Soviet system. 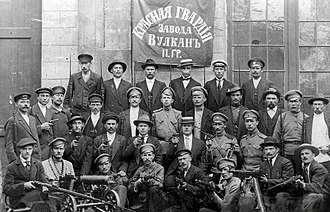 On 10 November 1917, three days after the Soviet seizure of power during the October Revolution, the executive committee of the national railroad labor union, Vikzhel, threatened a national strike unless the Bolsheviks shared power with other socialist parties and dropped the uprising's leaders, Lenin and Trotsky, from the government. 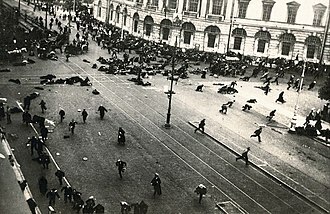 Zinoviev, Kamenev and their allies in the Bolshevik Central Committee argued that the Bolsheviks had no choice but to start negotiations, since a railroad strike would cripple their government's ability to fight the forces that were still loyal to the overthrown Provisional Government. 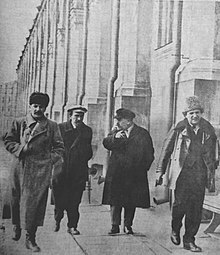 Although Zinoviev and Kamenev briefly had the support of a Central Committee majority and negotiations were started, a quick collapse of the anti-Bolshevik forces outside Petrograd aided Lenin and Trotsky to convince the Central Committee to abandon the negotiating process. In response, Zinoviev, Kamenev, Alexei Rykov, Vladimir Milyutin and Victor Nogin resigned from the Central Committee on 4 November 1917 (Old Style) and Kamenev resigned from his Central Executive Committee post. 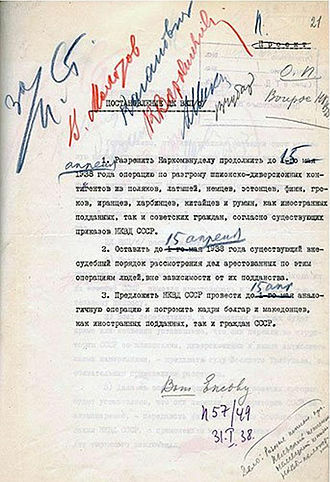 The following day Lenin wrote a proclamation calling Zinoviev and Kamenev "deserters." He never forgot their behavior, eventually making an ambiguous reference to their "October episode" in his Testament. In 1918, Kamenev became chairman of the Moscow Soviet, and soon thereafter Lenin's Deputy Chairman of the Council of People's Commissars (government) and the Council of Labour and Defence. In March 1919, Kamenev was elected as a full member of the first Politburo. His personal relationship with his brother-in-law Trotsky, which was good in the aftermath of the 1917 revolution and during the Russian Civil War, lessened after 1920. For the next 15 years, Kamenev was a friend and close ally of Grigory Zinoviev, who exceeded him in ambition. During Lenin's illness, Kamenev was appointed as the acting Council of People's Commissars and Politburo chairman. Together with Zinoviev and Joseph Stalin, he formed a ruling 'triumvirate' (or 'troika') in the Communist Party, and played a key role in the marginalization of Trotsky. The triumvirate carefully managed the intra-party debate and delegate selection process in the fall of 1923 during the run-up to the XIIIth Party Conference, securing a vast majority of the seats. 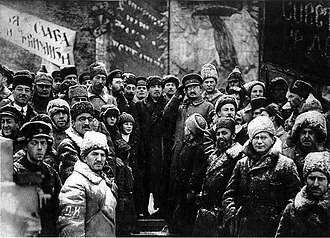 The Conference, held in January 1924 immediately prior to Lenin's death, denounced Trotsky and "Trotskyism." In the spring of 1924, while the triumvirate was criticizing the policies of Trotsky and the Left Opposition as "anti-Leninist", the tensions between the volatile Zinoviev and his close ally Kamenev on one hand, and the cautious Stalin on the other, became more pronounced and threatened to end their fragile alliance. However, Zinoviev and Kamenev helped Stalin retain his position as General Secretary of the Central Committee at the XIIIth Party Congress in May–June 1924 during the first Lenin's Testament controversy, ensuring that the triumvirate gained more political advantage at Trotsky's expense. In October 1924, Stalin proposed his new theory of Socialism in One Country in opposition to Trotsky's theory of Permanent revolution, while Trotsky published "Lessons of October," an extensive summary of the events of 1917. In the article, Trotsky described Zinoviev and Kamenev's opposition to the Bolshevik seizure of power in 1917, something that the two would have preferred left unmentioned. This started a new round of intra-party struggle, with Zinoviev and Kamenev once again allied with Stalin against Trotsky. They and their supporters accused Trotsky of various mistakes and worse during the Russian Civil War. Trotsky was ill and unable to respond much to the criticism, and the triumvirate damaged Trotsky's military reputation so much that he was forced out of his ministerial post as People's Commissar of Army and Fleet Affairs and Chairman of the Revolutionary Military Council in January 1925. Zinoviev demanded Trotsky's expulsion from the Communist Party, but Stalin refused to go along with this and skillfully played the role of a moderate. At the XIVth Conference of the Communist Party in April 1925, Zinoviev and Kamenev found themselves in a minority when their motion to specify that socialism could only be achieved internationally was rejected, resulting in the triumvirate of recent years breaking up. At this time, Stalin was moving more and more into a political alliance with Nikolai Bukharin and the Right Opposition, with Bukharin having elaborated on Stalin's Socialism in One Country policy, giving it a theoretical justification. With Trotsky mostly on the sidelines through a persistent illness, the Zinoviev-Kamenev-Stalin triumvirate collapsed in April 1925, although the political situation was hanging in the balance for the rest of the year. All sides spent most of 1925 lining up support behind the scenes for the December Communist Party Congress. Stalin struck an alliance with Nikolai Bukharin, a Communist Party theoretician and Pravda editor, and the Soviet prime minister Alexei Rykov. Zinoviev and Kamenev strengthened their alliance with Lenin's widow, Nadezhda Krupskaya, and also aligned with Grigori Sokolnikov, the People's Commissar for Finance and a candidate Politburo member. Their alliance became known as the New Opposition. The struggle became more open at the September 1925 meeting of the Central Committee, and came to a head at the XIVth Party Congress in December 1925, when Kamenev publicly demanded the removal of Stalin from the position of the General Secretary. With only the Leningrad delegation (controlled by Zinoviev) behind them, Zinoviev and Kamenev found themselves in a tiny minority and were soundly defeated. Trotsky remained silent during the Congress. Zinoviev was re-elected to the Politburo, but Kamenev was demoted from a full member to a non-voting member, and Sokolnikov was dropped altogether. Stalin succeeded in having more of his allies elected to the Politburo. 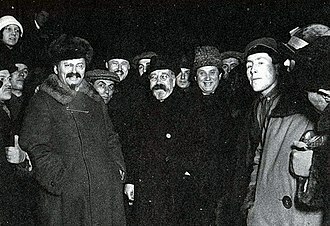 The photo shows the leadership of the USSR: Joseph Stalin, General Secretary of the Communist Party; Alexei Rykov, Chairman of the Council of People's Commissars (Prime Minister); Lev Kamenev, Deputy Chairman of the Council of People's Commissars (Deputy Prime Minister); Grigory Zinoviev, Chairman of the Comintern's Executive Committee. Apr 1925. 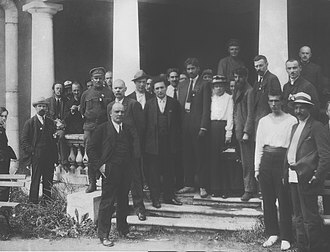 In early 1926, Zinoviev, Kamenev and their supporters gravitated closer to Trotsky's supporters; with the two groups forming an alliance, which became known as the United Opposition. 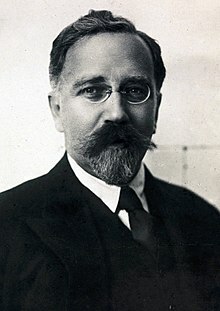 During a new period of intra-Party fighting between the July 1926 meeting of the Central Committee and the XVth Party Conference in October 1926, the United Opposition was defeated and Kamenev lost his Politburo seat at the Conference. Kamenev continued to oppose Stalin throughout 1926 and 1927, resulting in his expulsion from the Central Committee in October 1927. After the expulsion of Zinoviev and Trotsky from the Communist Party on 12 November 1927, Kamenev was the United Opposition's chief spokesman within the Party, representing its position at the XVth Party Congress in December 1927. Kamenev used the occasion to appeal for reconciliation among the groups. His speech was interrupted 24 times by his opponents - Bukharin, Ryutin, and Kaganovich, making it clear that Kamenev's attempts were futile. The Congress declared United Opposition views incompatible with Communist Party membership; it expelled Kamenev and dozens of leading Oppositionists from the Party. This paved the way for mass expulsions in 1928 of rank-and-file Oppositionists, as well as sending prominent Left Oppositionists into internal exile. 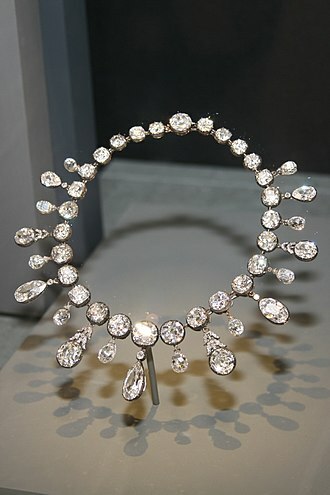 Kamenev's first marriage, which had begun to disintegrate in 1920, as a result of his reputed affair with the British sculptress Clare Sheridan, ended in divorce in 1928 when he left Olga Kameneva and married Tatiana Glebova. They had a son together, Vladimir Glebov (1929–1994). While Trotsky remained firm in his opposition to Stalin after his expulsion from the Party and subsequent exile, Zinoviev and Kamenev capitulated almost immediately and called on their supporters to follow suit. They wrote open letters acknowledging their mistakes and were readmitted to the Communist Party after a six-month cooling-off period. They never regained their Central Committee seats, but they were given mid-level positions within the Soviet bureaucracy. Kamenev and, indirectly, Zinoviev, were courted by Bukharin, then at the beginning of his short and ill-fated struggle with Stalin, in the summer of 1928. This activity was soon reported to Joseph Stalin and used against Bukharin as proof of his factionalism. Zinoviev and Kamenev remained politically inactive until October 1932, when they were expelled from the Communist Party for failure to inform on oppositionist party members during the Ryutin Affair. After again admitting their alleged errors, they were readmitted in December 1933. They were forced to make self-flagellating speeches at the XVIIth Party Congress in January 1934, where Stalin paraded his erstwhile political opponents, showing them to be defeated and outwardly contrite. The murder of Sergei Kirov on 1 December 1934 was a catalyst for what are called Stalin's Great Purges, as he initiated wide-sweeping show trials and executions of opponents. Grigory Zinoviev, Kamenev and their closest associates were again expelled from the Communist Party and were arrested in December 1934. At a time when my soul is filled with nothing but love for the party and its leadership, when, having lived through hesitations and doubts, I can boldly say that I learned to highly trust the Central Committee's every step and every decision you, Comrade Stalin, make," Kamenev wrote. "I have been arrested for my ties to people that are strange and disgusting to me. The men were tried in January 1935 and were forced to admit "moral complicity" in Kirov's assassination. Zinoviev was sentenced to ten years in prison and Kamenev to five. Kamenev was charged separately in early 1935 in connection with the Kremlin Case and, although he refused to confess, was sentenced to ten years in prison. In August 1936, after months of careful preparations and rehearsals in Soviet secret police prisons, Zinoviev, Kamenev and 14 others, mostly Old Bolsheviks, were put on trial again. This time the charges including forming a terrorist organization that allegedly killed Kirov and tried to kill Stalin and other leaders of the Soviet government. This Trial of the Sixteen (or the trial of the "Trotskyite-Zinovievite Terrorist Center") was one of the Moscow Show Trials, and it set the stage for subsequent show trials. Old Bolsheviks were forced to confess increasingly elaborate and monstrous crimes, including espionage, poisoning, sabotage, and so on. Like other defendants, Kamenev was found guilty and executed by firing squad on 25 August 1936. In 1988, during perestroika, Kamenev, Zinoviev and his co-defendants were formally cleared of all charges by the Soviet government. After Kamenev's execution, his relatives suffered similar fates. Kamenev's second son, Yu. L. Kamenev, was executed on 30 January 1938, at the age of 17. His eldest son, air force officer A.L. Kamenev, was executed on 15 July 1939, at the age of 33. His first wife, Olga, was executed on 11 September 1941, in the Medvedev forest outside Oryol, together with Christian Rakovsky, Maria Spiridonova, and 160 other prominent political prisoners. Only his youngest son, Vladimir Glebov, survived Stalin's prisons and labor camps, living until 1994. ^ Lindemann, Albert S. Esau's Tears: Modern Anti-Semitism and the Rise of the Jews. Cambridge University Press. p. 430. ISBN 0-521-79538-9. ^ David Evans and Jane Jenkins, Years of Russia and the USSR 1851-1991, Hodder Murray, 2001, p.221. ^ FROM THE CENTRAL COMMITTEE OF THE RUSSIAN SOCIAL-DEMOCRATIC LABOUR PARTY (BOLSHEVIKS) by V.I. Lenin, Written on November 5 or 6 (18 or 19), 1917, as published in From V. I. Lenin, Collected Works, 4th English Edition, Progress Publishers, Moscow, 1964 Vol. 26, pp. 303-307. ^ a b See Michael Parrish. The Lesser Terror: Soviet State Security, 1939-1953, Westport, CT: Praeger Publishers, 1996, ISBN 0-275-95113-8 p. 69. Corney, Frederick C., ed. Trotsky's Challenge: The "Literary Discussion" of 1924 and the Fight for the Bolshevik Revolution. (Chicago: Haymarket Books, 2017). Haupt, Georges, and Jean-Jacques Marie. Makers of the Russian Revolution: Biographies (Routledge, 2017). Rabinowitch, Alexander. Prelude to Revolution: The Petrograd Bolsheviks and the July 1917 Uprising (1968). Ulrich, Jürg: Kamenew: Der gemäßigte Bolschewik. Das kollektive Denken im Umfeld Lenins. VSA Verlag, Hamburg 2006, ISBN 3-89965-206-1. "Unpersonen": Wer waren sie wirklich? Bucharin, Rykow, Trotzki, Sinowjew, Kamenew. Dietz Verlag, Berlin 1990, ISBN 3-320-01547-8. Wikimedia Commons has media related to Lev Kamenev. Trotsky initially supported the Menshevik Internationalists faction of the Russian Social Democratic Labour Party. He joined the Bolsheviks just before the 1917 October Revolution, and he was, alongside Lenin, Kamenev, Stalin and Bubnov, one of the seven members of the first Politburo, founded in 1917 to manage the Bolshevik Revolution. He was a figure in the Bolshevik victory in the Russian Civil War. As the head of the Fourth International, Trotsky continued to oppose the Stalinist bureaucracy in the Soviet Union from exile, on Stalins orders, he was assassinated in Mexico in August 1940 by Ramón Mercader, a Spanish-born Soviet agent. Trotskys ideas formed the basis of Trotskyism, a school of Marxist thought that opposes the theories of Stalinism. He was written out of the books under Stalin, and was one of the few Soviet political figures who was not rehabilitated by the government under Nikita Khrushchev in the 1950s. It was not until the late 1980s that his books were released for publication in the Soviet Union and his parents were David Leontyevich Bronstein and his wife Anna Lvovna. 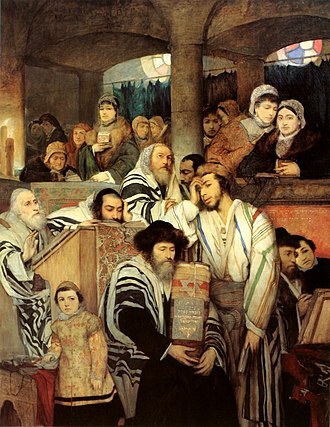 The family was of Jewish origin, the language they spoke at home was Surzhyk, a mixture of Russian and Ukrainian. Trotskys younger sister, who grew up to be a Bolshevik. Many anti-Communists, anti-semites, and anti-Trotskyists have noted Trotskys original surname, some authors, notably Robert Service, have claimed that Trotskys childhood first name was the Yiddish Leiba. The American Trotskyist David North said that this was an apparent attempt to emphasize Trotskys Jewish origins but, contrary to Services claims and he says that it is highly improbable that the family was Jewish, as they did not speak Yiddish, the common language among eastern European Jews. Both North and Walter Laqueur in their books say that Trotskys childhood name was Lyova, when Trotsky was nine, his father sent him to Odessa to be educated in a Jewish school. He was enrolled in a German-language school, which became Russified during his years in Odessa as a result of the Imperial governments policy of Russification. As Isaac Deutscher notes in his biography of Trotsky, Odessa was a cosmopolitan port city. Grigory Yevseevich Zinoviev, born Hirsch Apfelbaum, known under the name Ovsei-Gershon Aronovich Radomyslsky, was a Bolshevik revolutionary and a Soviet Communist politician. Zinoviev was one of the seven members of the first Politburo, founded in 1917 in order to manage the Bolshevik Revolution, Zinoviev, Trotsky, Stalin and Bubnov. Zinoviev is best remembered as the head of the Communist International. He was in competition against Joseph Stalin who eliminated him from the Soviet political leadership in 1926, Zinoviev was the alleged author of the Zinoviev letter to British communists, urging revolution, and published just before the 1924 general election, apparently to provoke a right-wing reaction. The letter is widely dismissed as a forgery, gregory Zinoviev was born in Yelizavetgrad, Russian Empire, to Jewish dairy farmers, who educated him at home. 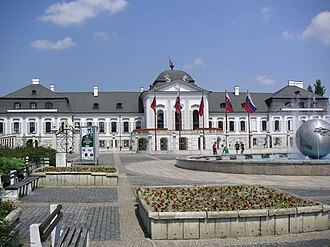 Between 1923 and 1935 the city was known as Zinovyevsk and he studied philosophy and history. He became interested in politics, and joined the Russian Social Democratic Labour Party in 1901 and he was a member of its Bolshevik faction from the time of its creation in 1903. He was elected to the RSDLPs Central Committee in 1907 and sided with Lenin in 1908 when the Bolshevik faction split into Lenins supporters, Zinoviev remained Lenins constant aide-de-camp and representative in various socialist organizations until 1917. Zinoviev spent the first three years of World War I in Switzerland, after the Russian monarchy was overthrown during the February Revolution, he returned to Russia in April 1917 in a sealed train with Lenin and other revolutionaries opposed to the war. He remained a part of the Bolshevik leadership throughout most of that year, however and Lenin soon had a falling out over Zinovievs opposition to Lenins call for an open insurrection against the Provisional Government. On October 10,1917, he and Lev Kamenev were the only two Central Committee members to vote against an armed revolt and their publication of an open letter opposed to the use of force enraged Lenin, who demanded their expulsion from the party. In response, Kamenev, Alexei Rykov, Vladimir Milyutin, the following day, Lenin wrote a proclamation calling Zinoviev and Kamenev deserters. Yakov Mikhailovich Sverdlov was a Bolshevik party administrator and chairman of the All-Russian Central Executive Committee. Sverdlov was born in Nizhny Novgorod as Yakov Mikhailovich Sverdlov to Jewish parents Mikhail Izrailevich Sverdlov and his father was a politically active engraver who produced forged documents and stored arms for the revolutionary underground. The Sverdlov family had six children, two daughters and four sons, after his wifes death in 1900, Mikhail converted with his family to the Russian Orthodox Church, married Maria Aleksandrovna Kormiltseva, and had two more sons and Alexander. Yakovs eldest brother Zinovy was adopted by Maxim Gorky, who was a frequent guest at the house, Yakov Sverdlov joined the Russian Social Democratic Labour Party in 1902, and the Bolshevik faction, supporting Vladimir Lenin. He was involved in the 1905 revolution while living in the Ural Mountains, after four years of high school, he became a major activist and speaker in Nizhny Novgorod. For most of the time from his arrest in June 1906 until 1917 he was imprisoned or exiled. During the period 1914–1916 he was in exile in Turukhansk, Siberia. Both had been betrayed by the Okhrana agent Roman Malinovsky, like Stalin, he was co-opted in absentia to the 1912 Prague Conference. 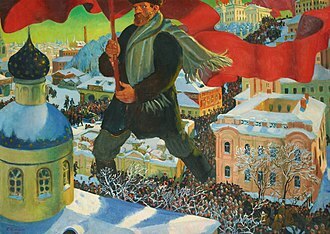 After the 1917 February Revolution Sverdlov returned to Petrograd from exile and was re-elected to the Central Committee of the Communist Party and he played an important role in planning the October Revolution. He first met Lenin in April 1917 and was trusted as the chairman of the Central Committee Secretariat. Sverdlov was elected chairman of the All-Russian Central Executive Committee in November and he played an important role in the controversial decision to end the Russian Constituent Assembly and the signing of the Treaty of Brest-Litovsk. Sverdlov had a memory and was able to retain the names. His organizational capability was well-regarded and during his chairmanship thousands of party committees were initiated. Sverdlov is sometimes regarded as the first head of state of the Soviet Union, although the Soviet Union wasnt established until 1922, a number of sources claim that Sverdlov played a major role in the execution of Tsar Nicholas II and his family. The official residence of the prime minister is Gorki-9 in Odintsovsky District, Moscow Oblast, but his working residence is in Moscow. Under Article 24 of the Federal Constitutional Law On the Government of the Russian Federation, the Russian Prime Minister is considered the second highest position in the government, after the President. Due to the role of the President of Russia in the political system. The use of the term Prime Minister is strictly informal and is never used by the Russian Constitution, Federal Laws, the current prime minister is Dmitry Medvedev of United Russia, who was appointed on May 8,2012. Since the office evolved rather than being created, it may not be totally clear-cut who was the first Prime Minister. However, these bodies had been only Advisory functions, and had no independence, the office of Chairman of those bodies were more decorative and do not bear any responsibility, simultaneously the position of Chairman could hold several people. 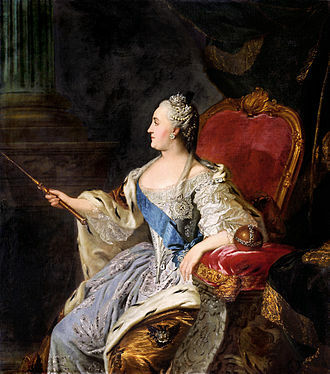 For example, from 1726 to 1727, the government headed by six people simultaneously, Alexander Menshikov, Fyodor Apraksin, Gavriil Golovkin, Andrey Osterman, Dmitry Golitsyn and Pyotr Tolstoy. From 1905 to 1917, the Chairman of the Council of Ministers, the modern post of Prime Minister appeared in 1905, after the transformation of the Committee of Ministers to the Council of Ministers. 6 November 1905, Sergei Witte was appointed the first Prime Minister of Russia, the position of Chairman of the Council of Ministers of the Russian Empire, lasted 12 years, during this time,7 people took this post. The position was abolished after the Russian revolution, the abdication of Nicholas II from the throne, during the Russian Provisional Government in 1917, the official title of the prime minister was Minister-Chairman of the Russian Provisional Government. This position was held by two people, Georgy Lvov and Alexander Kerensky. The position lasted about six months, and after the October Revolution, was replaced by Chairman of the Council of peoples Commissars of the Russian SFSR. In the era of the Soviet Union, the head of government was the Chairman of the Council of Peoples Commissars, people who held those positions are sometimes referred to as the prime ministers. Olga Davidovna Kameneva was a Russian Bolshevik revolutionary and a Soviet politician. She was the sister of Leon Trotsky and the first wife of Lev Kamenev, Olga Bronstein was born in Yanovka, Kherson Governorate, Russian Empire, a small village 15 miles from the nearest post office. She was one of two daughters of a wealthy but illiterate farmer, David Leontyevich Bronstein, a Jewish colonist, although the family was of Jewish extraction, they were not religious and the languages spoken at home were Russian and Ukrainian, not Yiddish. Olga Bronstein joined the Russian Social Democratic Labor Party in 1902 and soon married Lev Kamenev, in 1908, after Lev Kamenevs release from prison, the Kamenevs left Russia for Geneva and Paris, where Lev Kamenev became one of Vladimir Lenins two deputies. The couple helped Lenin edit the main Bolshevik magazine Proletariy, in January 1914 the Kamenevs moved to St. Petersburg so that Lev could be in immediate control of the Bolsheviks legal newspaper Pravda and their Duma faction. In early 1918, after the October Revolution of 1917, Kameneva was put in charge of the Theater Division of the Peoples Commissariat for Education, working with theatrical director and theorist Vsevolod Meyerhold, she tried to radicalize Russian theaters, effectively nationalizing them under Bolshevik control. However, Meyerhold came down with tuberculosis in May 1919 and had to leave for the south, in his absence, the head of the Commissariat, Anatoly Lunacharsky, secured Lenins permission to revise government policy in favor of more traditional theaters and dismissed Kameneva in June. 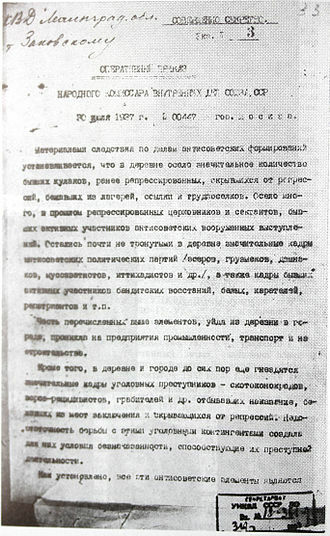 From the time it was organized in October 1919, Kameneva was a member of the board of directors of the Soviet Communist Partys Womens Section, in 1920 she supported Peoples Commissar of Public Health Nikolai Semashkos opinion that contraception was unquestionably harmful and should not be advocated. In 1923-1925 she was the head of the short-lived Commission for Foreign Relief, throughout the 1920s she ran a leading literary salon in Moscow. From left to right, top row: Ivar Smilga, Vasily Schmidt, Sergey Zorin. Middle row, left to right: Grigory Evdokimov, Joseph Stalin, Vladimir Lenin, Mikhail Kalinin, Pyotr Smorodin. Upper row: Pavel Malkov, Eino Rahja, Mirsaid Sultan-Galiev, Pyotr Zalutsky, Jacob Drobnis, Mikhail Tomsky, Moisei Kharitonov, Adolph Joffe, David Riazanov, Alexey Badayev, Leonid Serebryakov, Mikhail Lashevich. Grigori Sokolnikov, Mikhail Frunze and Valerian Kuybyshev head the Turkestan front. The image taken during Aug 1920 Red Army troops offensive against the city of Bukhara.